The Samson Expedition XP300 is an all-in-one sound system that offers excellent audio quality with quick and easy setup. Providing 300 watts of power, the XP300 features a lightweight, 6-channel powered mixer and two 6" speakers. 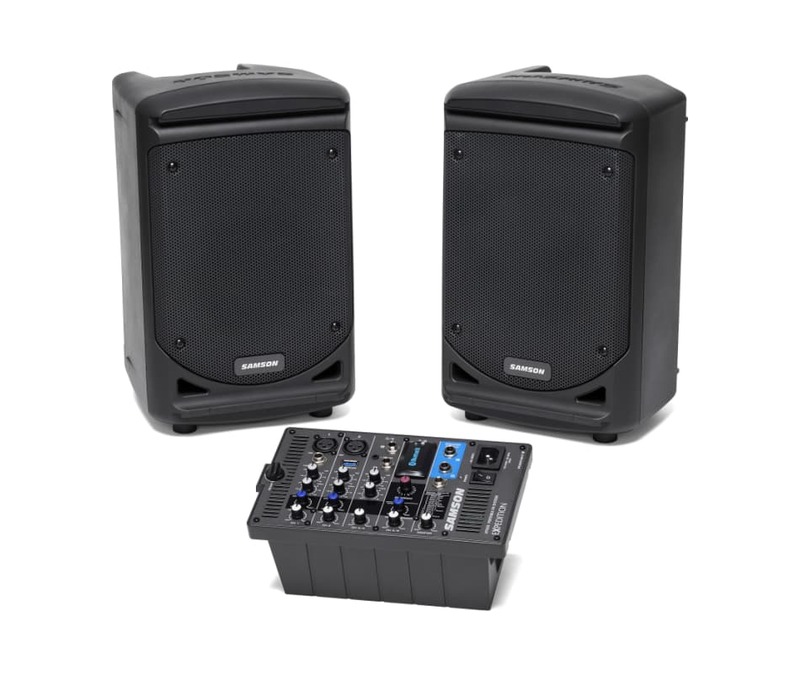 For enhanced portability, the XP300 offers a unique speaker-locking design that allows the system and all its components to be packed up and transported as a single unit weighing less than 30 pounds. The XP300 speaker enclosures feature 1 3/8" speaker stands mounts, as well as a tilt-back design that allows them to be used as stage monitors. The mixer section can be removed and mounted on any standard mic stand using the Samson SMS308 Mixer Stand Holder (sold separately). Lastly, two 10' speaker cables are included with the system.